The C.R. Rao Advanced Institute for Mathematics, Statistics, and Computer Science (AIMSCS) has great pleasure in congratulating S.R.S. Varadhan, Professor of Mathematics and Frank J. Gould Professor of Science at Courant Institute of Mathematical Sciences for the prestigious Abel Prize in Mathematics awarded by the Norwegian Academy of Sciences and Letters. The citation of the award refers to Varadhan's fundamental contributions to probability theory and, in particular, to creating a unified theory of large deviations as having "great conceptual strength and ageless beauty." A short biography on the Abel Prize website refers to his academic career at the Indian Statistical Institute (ISI), "where he received his Ph.D. with C.R. 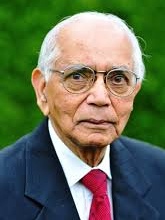 Rao, the distinguished statistician, as his thesis advisor". For more information, please go to http://www.abelprisen.no/en/.